A variety of noni fruit juice products are available. Healthy-skincare.com provides you with a number of product options as shown below so that you can buy noni juice and possibly experience the noni juice benefits. Not all noni products have the same potency and individual products can produce varying results in people. Many people to relieve skin problems or other health ailments use noni juice. There is plenty of anecdotal evidence both historical and recent, which supports its use, but few concrete scientific studies. Many people swear that noni fruit juice helped them reduce their symptoms, whether the symptoms were related to a skin condition or other health problem. There are also stories about noni fruit juice curing some health problems. Without controlled medical and scientific studies, it is difficult to validate these cure claims. However, there are enough testimonials to indicate that noni fruit juice does appear to contribute to helping individuals with some of their health issues. There is no one product to recommend. Daily dosage is usually 30 ml. Normally, 3 to 4 months of daily usage is required before any effects are noticed. In addition, because not all products result in the same effects, it might be necessary to experiment with different brands to see if one brand works better than others. If after 3 to 4 months of use of a specific product and subsequent experimentation with different brands produces no noticeable changes in your health, then noni juice may not be for you. For more serious health problems, do not discontinue your regular medication to take noni fruit juice without consulting with your physician. There are no guarantees that noni fruit juice will work for you. Personal experimentation with the product and consultation with a physician are key in determining whether noni juice is right for you and if it has benefited your health. Pure Hawaiian Puna Noni Juice by Noni Connection comes from the Puna district of the Big Island of Hawaii. On the slopes of long-slumbering volcanos, sun-ripened Noni fruit is handpicked, and then aged in the traditional Hawaiian way of our forefathers. When the juice is properly aged and bursting with health and vitality, it is shipped to Honolulu, and bottled under rigorously enforced sterile conditions. This noni juice is 100% pure Noni fruit juice, WITHOUT ADDITIVES OF ANY KIND. It is not made from concentrate. It is made from handpicked fruit that is naturally aged in the traditional Hawaiian way, a process that takes from 1 to 3 months. 100% Pure Hawaiian Puna Noni fruit juice contains no fruit juice, water, preservatives, flavorings, or colorings. The taste, while powerful, is not awful tasting, it just takes getting used to! Noni Connection is a small, family-owned and operated business located about 35 miles north of Honolulu in the rural farming community of Waialua on the rugged northwestern coast of the island of Oahu. Unlike most sellers of Hawaiian Noni Fruit Juice they actually live, work, and raise their families right there in Hawaii. Suggested Use: The recommended dosage is 1oz (2T) daily, first thing in the morning on an empty stomach. This is important so that the juice reaches the small intestine intact where the beneficial nutrients are released into the body. After several weeks, the dosage may be increased or decreased as required. Some experts recommend much higher dosages for the treatment of cancers or tumors. And, unless you simply cannot tolerate the powerful taste of noni juice, we recommend that you drink it straight, without diluting it with water or fruit juice. Remember that each of us is unique in terms of age, health status, and tolerance for different types of medicines. At any given moment there are thousands of chemical reactions taking place within our bodies. This accounts for a wide variety of individual reactions to noni. Some people will notice a difference immediately, while others may take longer to experience the benefits. Our experience with noni indicates that most people will notice some effect within the first month. 100% Pure Hawaiian Puna Noni Juice by Noni Connection - 32oz. 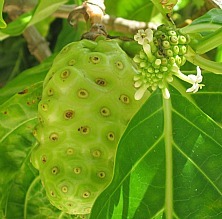 For thousands of years the people of Polynesia have used parts of the Noni (Morinda citrifolia) plant to treat health concerns. Compare this 25 oz. bottle against any other pure noni juice for potency and price: It's the best for less. Our PURE Noni Juice is not diluted with water nor is it adulterated with additives or flavors of any kind. We sell 100% pure, 100% natural, 100% organic noni fruit juice (morinda citrifolia). Our noni juice is NOT a reconstituted product. Pure noni juice should be reddish brown and should contain little or no pulp. The taste of pure noni fruit juice is bitter. Our noni fruit juice is flash pasteurized. Our 100% Pure Noni Fruit Juice is independently tested and verified for potency. The highest quality pure noni juice for the best price! 100% pure Noni Juice, no additives or preservatives. Efficiently absorbed in potent liquid form. This 25 oz. size offers better retail price per ounce than competitor's 12 oz., 16 oz. or 32 oz. sizes. Packaged and sealed in glass bottles in a high-tech ISO-9001 rated facility. Suggested Use: Take 1 tablespoon (15ml) only as a dietary supplement. Refrigerate after opening. Ingredients: 100% Pure Certified Organic (Noni) Morinda Citrofolia fruit juice from Tahiti. 100% Pure Certified Organic Noni Juice from Tahiti by Natural Styles - 25oz. The ''Doctor Recommended'' 100% pure Noni product. 100% Pure wild-grown and wild-harvested Noni juice with nothing added, not even water. Very high in organic minerals, trace minerals, over 160 nutrients and other novel compounds such as: Damnacanthal, Scopoletin, Anthraquinones, Acubin, Alazin, and Asperuloside. Helps support healthy serotonin levels. Supports healthy immune system function. Supports healthy inflammatory processes. Supports healthy energy levels and healthy microbial balance. Supports the detoxification pathways of the body and healthy blood sugar levels. Natural digestive. Analysis showd that one bottle of Genesis Today NONI100 is equal to between 3 to 8 bottles of Noni produced and marketed by other companies. Contains only 100% pure wild-grown and wild-harvested Noni Juice - no added fruit juice, sweeteners, sugar, preservatives or water! There are no added ingredients in this product. 30,000 mg of pure Noni in every serving. Picked, cleaned, aged and juiced the exact way it has been done traditionally for the past 2,000 years by the indigenous islanders of the South Pacific. We manage, oversee and maintain long-term exclusive contracts with over 16 organic and wild harvested, beautiful farms in the South Pacific. Every single production batch comes with a Certificate of Analysis and complete Micro Biological Contamination test. Organic Noni Juice (Morinda Citrifolia) by Dynamic Health, Natural Flavor. Certified Organic Tahitian Noni Juice (100% pure Morinda Citrofilia) Noni... Polynesia's Treasured Fruit. 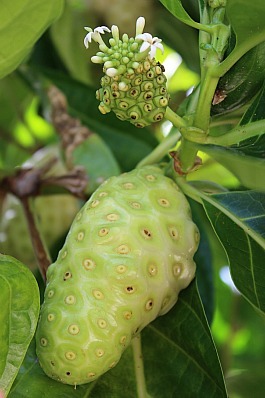 The fruit of the Morinda Citrifolia (NONI) plant has been treasured for thousands of years by the native peoples inhabiting the exotic islands throughout Polynesia. The warm tropical climate & nutrient rich soil guarantee nearly perfect conditions for these plants to blossom. NONI has been used traditionally to help promote healthy living. NONI... Polynesia's Treasured Fruit Used by Traditional Polynesian Healers to: *Improve General Metabolism. *Strengthen the Immune System. *Boost Energy Level. *Improve Circulation. *Promote Healthy Joints. *Support the Digestive System. *Aid in the Healing Process. Store at room temperature. Shake well before using. Refrigerate after opening. Noni contains naturally occuring minerals, enzymes, anti-oxidants, vitamins, phytonutrients, & Bioflavonoids. It contains no preservatives, pesticides, artificial colors & fertilizers. Suggested Use: Take 2 tablespoons (1fl. oz.) daily on an empty stomach, preferably in the morning, or as directed by your health care professional. Organic Noni Juice (Morinda Citrifolia) by Dynamic Health - 32oz. The fruit of the Morinda Citrifolia plant is treasured throughout Polynesia, Asia Hawaii and the Tropical Islands. It has been used to promote healthy living for many generations. Tahiti Trader Noni Juice can help increase mental clarity and attention span, as well as allow greater physical performance levels. It also benefits the following systems of the body: Immune system: supports the Immune system's natural ability to fight disease and infection. Circulatory system, tissues, and cells: Tahiti Trader Noni Juice is a superior antioxidant that helps rid the body of harmful free radicals. It also helps increase energy levels. Digestive system: Tahiti Trader Noni supports proper digestion and helps you absorb more nutrients at the cellular level. Skin and hair: Tahiti Trader Noni Juice contains components that are specifically important to the skin and hair. It also helps carry beneficial substances to the skin. 1-3 ounces daily on an empty stomach Serving Size: 1oz Servings per Container: 32 Amount Per Serving % Daily Value** Calories 20 Total Fat 0 Sodium 11 mg <1 Total Carbohydrates 5 g <2 Sugars 4 g Soluble Fiber 1.1 g <1 Vitamin A 2 1 Vitamin C 8.27 mg <10 Calcium 3 mg <1 Magnesium 1.09 mg <1 Potassium 37 mg 15 ** Percent Daily Value is based on a 2000 calorie diet. Your daily values may be higher or lower depending on your calorie needs. Daily Value not established. Other ingredients: Fresh Non-fermented Noni Fruit Juice (Morinda Citrifolia), Blueberry Juice, Raspberry Juice, Grape Juice, Pear Juice and Natural Flavors.